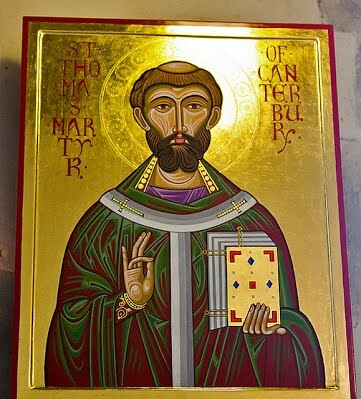 December 29 - Saint Thomas Becket, Bishop and Martyr – Optional Memorial - My Catholic Life! ST. THOMAS, son of Gilbert Becket, was born in Southwark, England, in 1117. When a youth he was attached to the household of Theobald, Archbishop of Canterbury, who sent him to Paris and Bologna to study law. He became Archdeacon of Canterbury, then Lord High Chancellor of England; and in 1160, when Archbishop Theobald died, the king insisted on the consecration of St. Thomas in his stead. St. Thomas refused, warning the king that from that hour their friendship would be broken. In the end he yielded, and was consecrated. The conflict at once broke out; St. Thomas resisted the royal customs, which violated the liberties of the Church and the laws of the realm. After six years of contention, partly spent in. exile, St. Thomas, with full foresight of martyrdom before him, returned as a good shepherd to his Church. On the 29th of December, 1170, just as vespers were beginning, four knights broke into the cathedral, crying: “Where is the archbishop? where is the traitor?” The monks fled, and St. Thomas might easily have escaped. But he advanced, saying: “Here I am—no traitor, but archbishop. What seek you?” “Your life,” they cried. “Gladly do I give it,” was the reply; and bowing his head, the invincible martyr was hacked and hewn till his soul went to God. Six months later Henry II. submitted to be publicly scourged at the Saint’s shrine, and restored to the Church her full rights.